Old faculty member, now eligible for social security, is looking forward to retiring and more time for golf, fishing and travel. Senior ranking faculty member Jim Tiller. That wouldn't be Jim Tiller. At the age of 66 he IS Sam Houston State's senior ranking tenured faculty member, but all that other stuff is about 180 degrees from the direction in which he's headed these days. While he may not exactly "love" computers, that's how he teaches. He never sees a student unless they drop by his office or e-mail him a digital photo of themselves. Each semester he directs some 300-400 students who take courses online. He values "good teaching" and still considers himself a good teacher--even though his students think he's tough. Like most faculty members he has a nickname, and like most nicknames, it describes with at least partial accuracy his teaching style. He's known around campus as "Killer Tiller." And while he may be eligible for social security, he's not remotely thinking of retirement. He has books and articles to write and presentations to give--too many to get tired now. "I'm just hoping I have enough time left," he says. "That my head doesn't go, my eyes don't go." 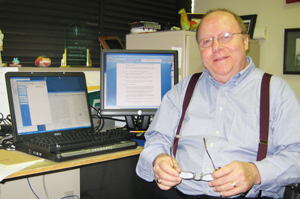 Tiller came to Sam Houston State as head of the geography department in 1972, after earning two degrees (master's and doctorate) at the University of Oklahoma and two (master's and bachelor's) at North Texas State. when he discovered a research interest that he can't get enough of. "I was admitted to college on scholastic probation," he says. "That's why I think our admission policy should be along the lines of 'let anyone in who's breathing.' For a lot of people, it doesn't come to them until it's too late in high school. I got to college and I loved it." When it came to research and publishing, Tiller did very little of it after he completed his doctoral dissertation in 1969 and when he was department chair from 1972-1982. His vita lists one publication in those 10 years. Jim Tiller teaches these days only by computer. There were a few more in the next 20 years, but it was not until he went to a family reunion in 2002, and decided to look into his family's history, that he appreciated how much fun research can be. The first member of his family to come to the United States was a William Tiller, who came as an indentured servant from England in 1655. His great-great-grandson, also William Tiller and Jim Tiller's great-great-grandfather, came to what is now Texas from Mississippi. He settled near Caddo Lake about three miles west of the present border with Louisiana, in December 1836. That was an area inhabited by the Caddo tribe of Native Americans--the same tribe that had a word that meant friendly, translated by the Spanish explorers as "Tejas," which later became "Texas." Tiller's research on his family has led to the discovery of three previously unknown Caddo villages. His work's real focus though is the unusual situation faced by settlers in that region from the years 1836 through 1841. Because of a border that was undefined at the time of the Louisiana Purchase in 1803, they were in reality citizens of neither Texas nor the United States. "There were very few people in this area until the Land Office was opened in early 1838," Tiller said. "A March 1837 petition from the region indicated 108 families living in an approximately 10,000 square mile area along the border--very, very sparsely populated as people at that time tended to cluster in small groups. Again, the border uncertainty was the problem." 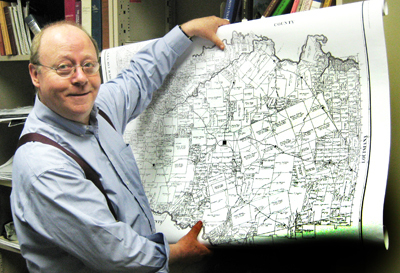 Jim Tiller holds a map showing the East Texas boundary dispute area. William Tiller was a carpenter, and most of the area residents were farmers, hunters and fishermen. It was a tough place. Lots of weapons, shootings, cuttings--all reflected in the legal documents Tiller pores over in the surviving courthouses, especially the one for Harrison County in Marshall. They had big families--William Tiller had a wife and one child when he came to the area and ultimately 12 children by two wives. Many of the Tiller clan still live in the area, including a 94-year-old uncle and Jim's father, now 89. Jim Tiller, along with his brother, Wayne, have completed the family history. Entitled Our American Adventure: The History of a Pioneer East Texas Family, 1657-1966, it should be off the press by June 1. Another book, tentatively titled Research Vignettes From Eastern Harrison County, 1836-1841, is under way but on an indeterminate schedule, driven only by the longevity of his "head" and "eyes." Other publications and presentations have included the Caddo Archeology Journal, Journal of Northeast Texas Archaeology, three articles in The Texas Surveyor, one article in The Quarterly Journal of the Texas State Genealogical Society with another one in that publication due out soon. Also, a paper presented at the Friends of Geography Conference, one at the East Texas Archeological Conference, another at the 49th Annual Caddo Conference, and two at annual meetings of the Southwestern Division of the Association of American Geographers. Next Friday he'll make a presentation at the Jefferson Historical Seminar of the Northeast Texas Chapter, Texas Society of Professional Surveyors. 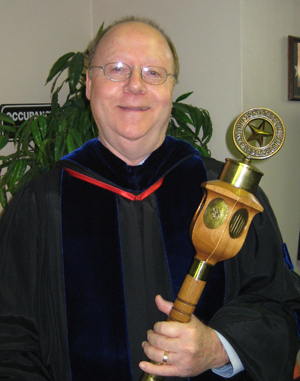 While Tiller has earned the honor of carrying the university mace at the head of commencement ceremony processions, as the university's senior ranking tenured faculty member, he won't be available for that duty this spring. He's scheduled to leave with another geography faculty member on what they call the Blues Field Trip Course along with a dozen or so students. John Strait is instructor for the course on the geography of the Mississippi Delta, which includes Memphis blues music and Elvis Presley. He said that even though he has known Tiller for only a couple of years, he appreciates his encouragement, advice, and especially his example. Also, he said, "no disrespect to his abilities as a researcher or a teacher, but Jim's honesty and integrity are what sticks out most in my mind." As for the research, Strait said, "It is obvious that he finds research personally rewarding, but I think he also sees it as part of his role. He is certainly not doing it in order to receive praise or reward, but because he is dedicated to learning and sharing the knowledge he develops. He is doing research for the right reasons and is doing a good job at it. He is an inspiration to the rest of us." Tiller said he realizes that research is not easy, even though it's more expected these days than when he came to SHSU. The secret to his burst of late-career productivity was finding a consuming interest, he said. He advises young faculty members to seek that out, instead of "just going through the motions." "If I had known research was so much fun I would have done it from the day I came to Sam Houston," he said.